Thread: Crazy moves in greyhound markets! Is there anyone who trades greyhound markets these days? What is going on in them? Some crazy bets coming in! Betfair graphs looking crazy, money matched at weird prices, for example there are markets where there is money matchet on 900 for all runners. prices go from 5 to 50, things like that! I just cant understand why it is happening, who has that much money to smash prices around like that and what is the benefit of that?.. Just wondering what some smarter traders maybe think! 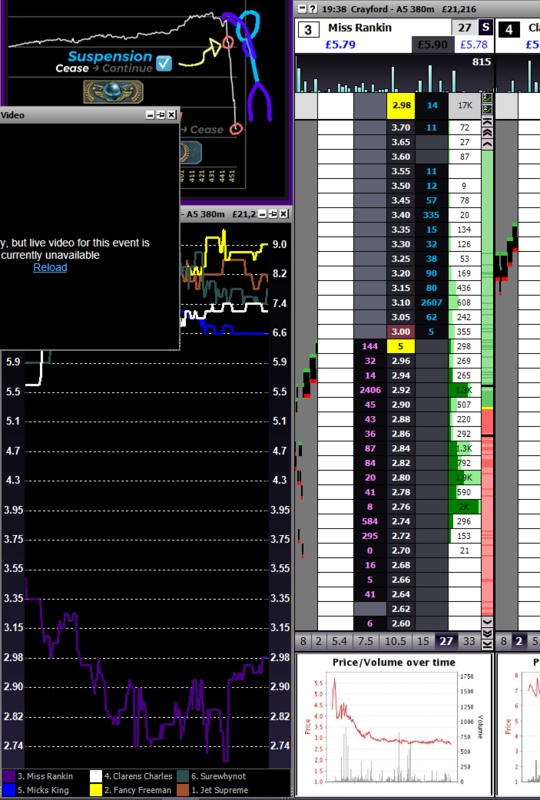 Crazy moves like this happen all the time, price goes from over 15 to 3.5 in 1 minute! Looks pretty standard for a low liquidity bot infested market . The ones with sharper moves are those with less liquidity, the ones with most volume are quite stable (but only a couple minutes before the off). Yeah some crazyness going on, just want to understand why! who is benefecting from it? just throwing in huge amounts of money at crazy places? Just saw 580 matched at 38 and 7000 matched at 2.0 on the same runner.. every market someone throwing in thousands. Often there is 2 matched at 900 on all runners! how can that be? Not complaining about it just can't understand why! I was about in the mkts today trading the big £2k bets that were flying around. After a few mkts I felt it became a case of savvy traders opposing the £ and one individual just looking to gamble with big stakes. I wouldn't give it too much weight because it all took place in the early market. Probably self-match across accounts but if not then you can't expect yourself to watch all the markets for this activity. Best you can do is set yourself up to get an alert when it happens but even then how do you know what the price is in the early market and what would your strategy be? ... hope to get matched on both sides AFTER the first 2 bets already happened? Plus only the back side was profitable there with the lay side losing a lot of £ if they traded out at the post. It's easy to aftertime but you have to ask yourself the question is it really worth the effort. For me that's a definite no. Are you trading GH markets every day ironmexx? What else do you trade? Just trying to maybe find a way to exploit it! Havent looked at the markets early in the morning, maybe could place orders around big prices, maybe get matched on some! It could probably be done with some automation. yeah i mostly trade greyhounds daily and also UK horse racing!